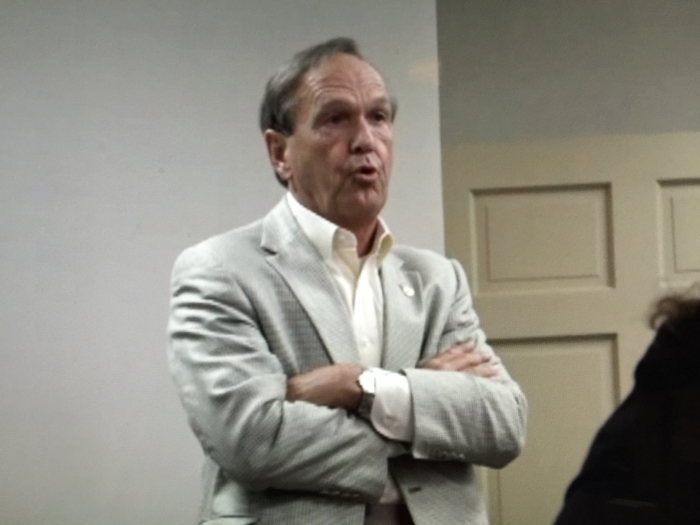 I’ve known Georgia State Sen. Fran Millar for nearly twenty years, broken bread with him, and I held a certain amount of respect for him, though that has diminished as I watched his slide toward the Trumpism that has consumed the Republican Party. I will not be voting for him in November. Millar has tried to separate himself somewhat from the president, claiming he likes Trump’s policies but not his behavior. That’s a distinction without a difference, since Trump’s behavior and policy are intertwined; both are children of his ego. Look out, Canada! If Millar dislikes Trump’s behavior, he has a funny way of showing it, because he’s been emulating POTUS. Millar can be gruff, acerbic, and disdainful to begin with, so there’s always that. But not only is he showing contempt for his female opponent, former State Rep. Sally Harrell, but he’s lying about her record. Sound familiar? Sally never passed any bills so she doesn’t understand that is what people actually want from their elected officials – solutions to problems. Never mind that he’s off-topic. He just had to get his shot in. Still, it makes you wonder about his focus. And his truthfulness, since it’s a boneheaded, easily refuted pants-on-fire lie that mainly serves to show his disdain for his former colleague. 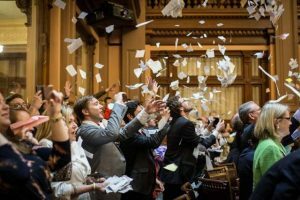 For the record, the first bill Sally passed was HB 717 in 1999, her rookie year, which instituted statewide newborn hearing screenings. 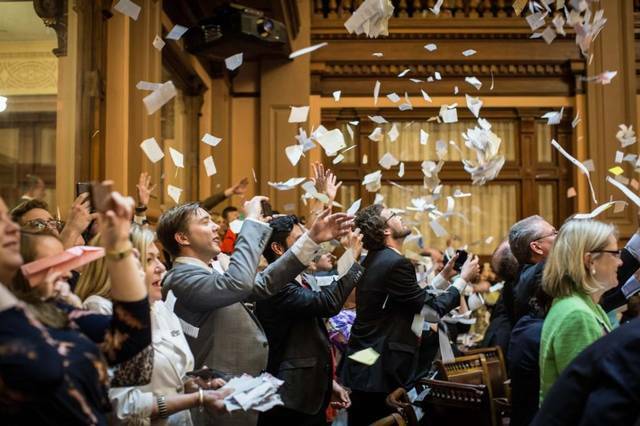 It has helped thousands of Georgia families for the past twenty years. By the way, Millar voted for it. Sally also cosponsored at least one of Millar’s bills. Don’t be ungrateful, Senator! So, to set the record straight, Sally did sponsor several successful pieces of legislation. In addition, she cosponsored several more, If you want to take a closer look at her overall legislative record, you can see it here for 1999-2000. For 2001-2004, you can visit her archived legislative webpage, and click “Legislation” on the bottom right. You’ll see her top priorities included making life better for families, children, and people in general. Ahead of her time, she pushed unsuccessfully to set up a study committee on prescription drug addiction. And for school recess. 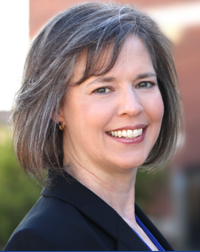 Unlike Millar, in 2004 she voted against putting Georgia’s gay marriage ban on the ballot as a Constitutional amendment. But that was then and this is now. You can read about Sally’s re-entry to politics here. For a more up-to-date look at the policies she advocates, visit her website. There’s another reason for Millar’s burst of negativity: The fear factor. Since his first three-way primary in 1998, Millar has never faced a well-organized, well-funded challenge until Sally came along. 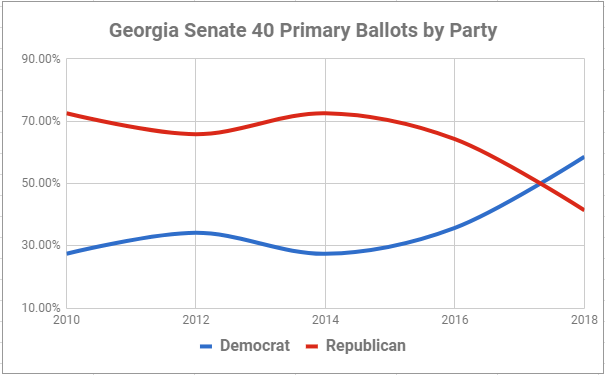 Senate District 40 is now considered Georgia’s “most flippable”—that is, most vulnerable to a Democratic victory over a Republican incumbent. Hillary Clinton won the 40th by 13 points, so there’s ample reason for Millar to be worried. And it seemed like he was concerned, for a while. 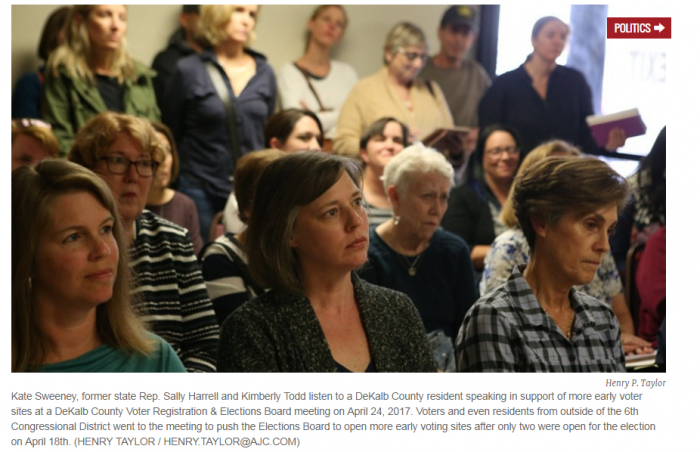 He called on the GOP to court minority voters after the 2016 election, but took the opposite tack in this year’s General Assembly session, supporting a bill that would block Sunday voting and prevent the City of Atlanta from keeping polls open until 8:00 p.m. This effort to suppress minority voting failed, but it’s the thought that counts. Millar also supported anti-LGBT adoption legislation in this year’s session. It passed the Senate, but failed in the house. In Trumpian fashion, Millar has decided to court the base and use sleazy tactics. But the GOP playbook may not work for him this time. He faces an opponent with a formidable organization and a strong message in an increasingly diverse district. It’s quite possible that Sally will wipe the sneer off Fran’s face. Disclosure: I am a Will Rogers Democrat, Rep. Scott Holcomb’s yard sign guy, and an unranked volunteer in Sally Harrell’s GASD40 campaign.